I tried to keep a limited value range with this one, to try and get that last light feeling. Above is the reworked painting. I bulldozed the building down and planted some trees. Here's today's painting. 24" x 30", oil on canvas. Thanks for looking. Adding a couple of detail pics. Today's effort. This one is 24" x 30" on stretched linen. This is a small, quick study I did as a possible prelude to a larger piece. Here's Joe and Joyce Guffey's backyard. Well, part of it. They are kind enough to let the family invade their space 2 or 3 times a year. How brave. I went in search of Van Gogh. 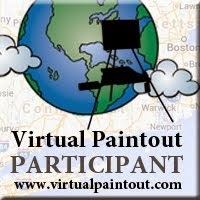 Traveling, through Google Street View, the roads and neighborhoods he walked and painted. I came upon this small street in Auvers, France, with old houses, gateways and staircases; named Rue Dr. Gachet. Not far from it is the Rue Van Gogh. I have no idea if the good doctor actually lived on this short street, or if maybe Van Gogh had walked these steps. But in my mind he was there, trying to talk the doctor into sitting for him. This painting felt so good. From the simple toning of the canvas, to the initial sketch and lay in of colors. You know, the feeling of excitement with each brushstroke. And not a feeling of creating something good, but just a feeling of creating. Thanks for looking and listening to the short ramble. A Street View painting done tonight. I'm including the screenshot and the painting to show how much I changed (for better or worse) the comp, colors, values, etc. This was an exercise; in futility? I'll wait a day or so to make that decision. I must admit I had lots of fun with the thick paint. 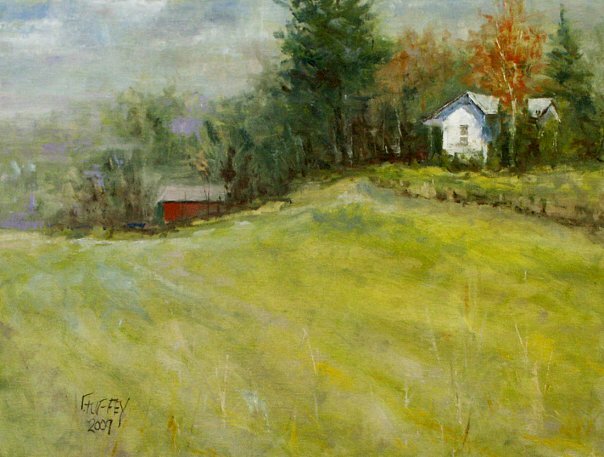 Did this one with a reference on the house and field from Street View, around Dubre, Kentucky. Been looking at a lot of Schmid lately, which influenced this one. Here's today's effort. Did this one from a plein air study and a photograph of the scene, from Dale Hollow Lake a few weeks back. The PA was horrible. Including a pic of me painting the PA.
Had a fun and interesting day today. I was interviewed by the local PBS Station (WKYU) in Bowling Green, Kentucky. The interview was held at Gallery at 916, which is currently home to many of my paintings. I was told before the interview that they wanted a few "working" shots. Me applying paint for some close up shots. Turned out I did a small painting, which I wasn't prepared for, during the shoot (about 30 to 45 minutes). I stinkified it up! Hoping they edit most of that part out, as I was pretty comfortable during the interview section. It was mostly about my use of Google Street View as reference to create my Street View State Series and other paintings, and the melding of technology and fine art. The spot should run in a couple of weeks. By the way, the paintings on the wall aren't mine. Mine were behind me during the interview though. Above is the finished piece. I worked on it for about 5 minutes tonight. Just couldn't leave it as it was. Still not satisfied, but happier all the same. Here's my latest with some detail shots. This is a big one. Here's my latest effort. I'm including a couple of shots as the painting was in progress, and a detail shot of the villa itself. The initial sketch was about 30 minutes. Then a 30 minute lunch break update, along with 30 minutes after work before going to a friend's house for supper. Finishing with a 2 hour session to end it.